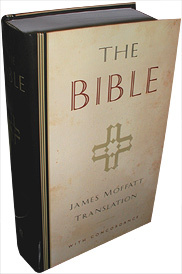 Once called "the original modern-language Bible" James Moffatt's translation of the Old and New Testaments began the twentieth century's trend of contemporary English versions. Moffatt's translation has been categorized as an "unofficial translation" -- no denominational or academic committee sponsored the effort -- but it received remarkably wide acceptance and remained the leading work of its type for many decades. Moffatt applied the theories of nineteenth-century textural criticism to the Bible and rearranged the order of some passages to conform to its views. While his methodology has been rejected by most conservative scholars his translation is a prodigious work of scholarship and a helpful resource for those wanting to effectively communicate the Bible in the English language. James Moffatt (1870-1944) Born and educated in Glasgow Scotland Moffatt spent the early years of his career as a pastor in the Free Church of Scotland. In 1911 he became Professor of Greek and New Testament Exegesis at Mansfield College Oxford and subsequently served at the United Free Church College Glasgow and at Union Theological Seminary New York as Washburn Professor of Church History. Moffatt took a leading role in preparation of the Revised Standard Version (1946) as well as writing numerous books on biblical and textural criticism. Moffatt is best remembered however for single-handedly translating the Bible. His New Testament was printed in 1913 followed by the Old Testament in 1924. Both translations were revised and reprinted together in 1935 and popularly known as Moffatt's Bible.